Okay, this is up on Ebay for the next four days or so, so get on the stick, people. I mean, look at this dress! I love the collar, that soft roll. 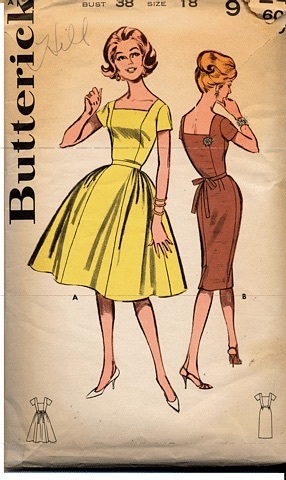 I love the pockets, and the sleeves, and the curved seam over the bust and below the waist. It's just a stunner, and still (esp. the narrow-skirted version) very wearable. I may not bid, though, if I can summon up some self-control, because I know the points on that curved seam above the bust will break me, send me to my knees, and make the air in my sewing den blue with the impotent curses of someone wielding a seam ripper. I've tried that particular seam, and not ever had any real success with it. At best, I've done brute-force topstitching, and, at worst, ripped through two bodice pieces, which then needed to be re-cut. And in neither case (or in any of the intermediate cases) did I end up with something I felt compelled to wear to rags. This dress is perfectly fine, really — I love Milly stuff and someday will find something from that line 1) in my size, 2) at Loehmann's and 3) not stained with the makeup of the careless person who tried it on before me. But the fabric is insanely great, and I just feel it could have been put to much better use than this perfectly serviceable and somewhat boring slipdress. If *I* had oh, four or five yards of this, I would make a wiggle dress with a coat matching the yellow of the roses in the pattern, lined with the same fabric. And, as long as I'm indulging my dress megalomania (and my inner Doris Day), matching yellow shoes. And bag. Sorry I didn't post yesterday. When you start your day at 7:30 a.m. in Manhattan and end it at 12:30 a.m. in Madison, Wisconsin, some things tend to fall by the wayside, like eating and blogging. I think the lack of sleep has made me cranky, because even though there were some really pretty dresses listed over the last 24 hours on eBay, this homemade horror is what caught my eye. No offense to the (very game) model in the picture, but this is my worst nightmare, and it's not made any less horrific just because it happens to me fairly often. This is what I mean: you spend a lot of time sewing something, and in your head, while you're pinning, cutting, seaming, and pressing, it looks FANTASTIC. Gorgeous. The fabric is your one true love. You can feel how nicely the dress will fit, like you'd feel a phantom limb. And then you put in the zipper, climb into it, and it looks like this. Arrrrgghhh! It's the triumph of hope over experience. You think "oh, THIS TIME the [empire waist|sash belt|jewel neck|whatever went wrong before] will look GOOOOOOD." Even if you make the same dress over and over, and never try anything new, occasionally the fabric and pattern will conspire and fight each other instead of reaching sartorial harmony. For a rainy Friday, a comfort dress. I scanned this ages ago for the Sewretro group on Yahoo, and just remembered the scan existed today. I love this so, although I've only made it once. The fabric wasn't right — not heavy enough to drape right in the slim-skirt view I made — so I didn't wear it often. There's something about a low, square neckline that calls to me. Maybe I am a collarbone exhibitionist? Who knows? But show me a square-necked dress and I am yours. I've always wanted to make this in two colors, with the center bodice and skirt panels (front only) a different color from the rest of the dress (black and white? gray and red?) but something tells me that would look like a particularly crazy silver-age superhero costume. Obviously, in this dress, my superpower would be making especially delicious canapés. "Rollkunstlaufkleid" seems to be the German for "roller skating dress." (I just thought you might like to know.) I've been thinking a lot lately about making a dress to wear rollerskating. I mean, NOT LIKE THIS ONE, please, no, are you crazy? (Although if you want one, click on the link to go to Ebay Canada. I am not making any comments as to why only Ebay Canada seems to sell any appreciable numbers of skating dresses.) And if you want one with a matching hair scrunchie (and, hey, why wouldn't you?) you can click here. Anyway. When I'm in NYC on a Wednesday, which is fairly often, I like to go rollerskating at the Roxy. Okay, "like" is a faint word. I am OBSESSED with rollerskating at the Roxy. I just love everything about it: the people, the music, the fact that everyone is set to maximum dork while on roller skates — everything. So I'm really thinking this one from a couple weeks back, done in pink camouflage jersey knit. But somehow that doesn't seem to take full advantage of the latitude given at the Roxy. Any suggestions? Remember, one of my favorite circle skirts is white with fist-sized multicolor polka dots, and I WEAR IT TO WORK (and I'm not an instructor at a clown college) so I need to kick it up a notch for the Roxy. Jilli sent me this link (thank you!) and all I can say it, Holy Mother of God! (You know I'm gobsmacked when I start breaking out the Irish-Catholic imprecations.) This dress is on eBay for the next four days, but there's no way I could get myself to a 25 inch waist (which is what this dress has) by then. I am seriously contemplating corsetry. (Where's my whalebone?) This dress is totally worth random fainting spells. But. Jeeeeee-sus. Look at this thing! Who knows, maybe it's just me and Jilli who want to look like slutbomb girl-shaped vintage upholstered sofas, but hey, if that's wrong, I don't want to be right. I want to be W25! So, this past weekend I was talking with my mom (hi mom!) and lamenting that I couldn't find a particular pair of shoes — moss green round-toed heels with an ankle strap. My mom was sympathetic (she has to be, she's my MOM) but I was bitter. "If I think of it, they're guaranteed not to exist." Okay, okay, I can hear you saying "Get to the dress! If I wanted to read the blogging about the shoes, I'd be reading The Manolo right now! He has more of the funny when blogging about the shoes! And he knows about the David Hasselhoff!" Well, anyway, after I figured out that I had this surprising power to instantiate items in the real world just by thinking of them, I thought I'd test it a bit more on trivial things before starting to wish for portable fusion power and various vaccines. (I've read "The Monkey's Paw," and a LOT of similar literature — I know how often wishes go wrong!) So last night I concentrated. I thought hard about a silk shirtwaist dress in a colorful print with an interesting collar and buttons. So what's the problem? I forgot to add "B36" when I was thinking about it, and this one is a B44. It will be a pain in all sorts of places to alter, but I think I'll try it. So what should I try for tomorrow?